I have just returned from a few days in and around Barcelona, where I had been invited to join Miguel Torres and his family to the opening celebrations for their new single vineyard cellars. It was Torres’ single vineyard Mas La Plana that put the estate on the fine wine map back in the 1970s, when it triumphed at the Paris Wine Olympiad organised by Gault-Millau, beating all comers including Chateau Latour. Whilst Mas La Plana has continued for almost 40 vintages, Torres has expanded with several other single vineyard projects in Spain, including the range-topping Grans Muralles, from a vineyard cultivated since the 13th century and now planted to Monastrell, Cariñena, Garnacha, Garró and Samsó. Grans Murailles is now Torres’ most expensive wine at over £40 per bottle, and a vertical tasting of it and other interesting single vineyard wines follows in part II. The new cellar is a stunning complex, housing not only the winery and barrel cellars, but also what amounts to an entire wine theme park. There are multimedia shows, a museum, tasting room and sculpture park, and a very nicely done sound, light and animation show that takes place within the cellars. 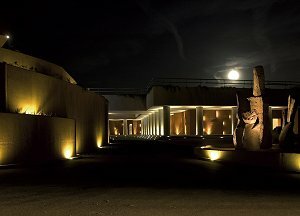 Sited close to the town of Vilafranca del Penedès, it is a world-class addition to wine tourism. It was terrific to meet not only Miguel and his artist wife Waltraud (pictured left), but also their children, Mireia who is Winemaker and Miguel junior, who is Director of Marketing. We were also joined by Miguel’s sister Marimar, who runs the eponymous Torres’ operation in the Sonoma Valley, and who had flown in for the occasion. 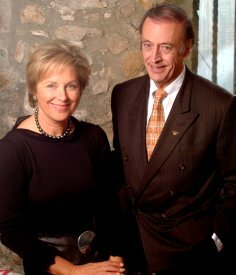 Though obviously of great significance for the business, there was an air of genuine family celebration at the opening, especially as the cellar is officially named the Waltraud cellar. Waltraud’s work adorns the walls of several rooms. As well as its design which sits ‘quietly’ in the Penedès landscape, Miguel also spoke with passion about the 12 million Euro building’s ecological credentials. These include ‘bio-climatic’ architecture that employs turf and water in the roof structure to require minimal energy for temperature control, and 12,000 square metres of solar panels that will generate around 15% of all the energy required by the complex. Indeed, with only a few years until he retires and hands over to the fifth generation completely, Michel spoke of his concern for the environment and for sustainability. He himself drives a Prius hybrid vehicle – one of more than 100 owned by the company. He has also been buying land at high altitude, not currently able to sustain viticulture, with an eye to its potential in 50 years if climate change makes the plains of Spain less suitable for cool-climate grapes like Sauvignon Blanc and Riesling. Next day we took a tour of some of the single vineyards, before heading to the beautifully restored Mas Rabell farmhouse, where Mireia led us through a tasting of six vintages of Mas La Plana, starting with that 1970 – the wine that put Mas La Plana on the global map. 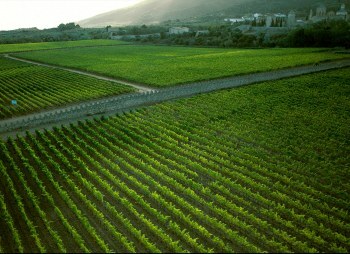 The Mas La Plana vineyard lies in Penedès, not far from the Torres family home. At just 29 hectares, the vineyard is planted to Cabernet Sauvignon and consists of yellow/brown loam and gravel soils over clay. There is a very low content of organic matter. The site is well ventilated, and enjoys a Mediterranean climate because of its proximity to the sea. As you will see from the notes, that 1970 vintage blended 30% of other grapes with Cabernet Sauvignon, and the oak barrel regime has changed subtly over the years too. But I was hugely impressed by the consistent quality and very specific expression of Cabernet Sauvignon given to these wines by the Mas La Plana vineyard. Mas La Plana costs around £23.00 per bottle, and is in some branches of Sainsbury’s, Morrison, Waitrose, Fenwick’s, Great Gaddesden Wines, Harrods, House of Fraser and Makro. See all stockists of Mas La Plana on wine-searcher.com. See all stockists of Mas La Plana on wine-searcher.com. Whilst Rioja, Jerez, and latterly Ribera del Duero took the plaudits as the homes of Spain’s greatest wines, Miguel Torres – proudly a son of this region as where previous generations of the Torres dynasty – quietly developed such wonderful vineyard sites as the Finca Milmanda, now home of some of Spain’s best Chardonnays, Finca Fransola where the Fransola Sauvignon Blanc is grown, and Grans Muralles. Grans Muralles is a beautiful vineyard, surrounded by the walls of a 13th century Cistercian monastery, and planted with a range of indigenous Spanish grapes: Monastrell, Cariñena, Garnacha, Garró and Samsó. That is in complete contrast to Mas La Plana, made from 100% Cabernet Sauvignon. Grans Muralles in the DO Conca de Barberà has been cultivated since Cistercian monks introduced vines here in the 13th century. Situated between the Milmanda Castle and the Monastery of Poblet, the site spans 94 hectares, though just 32 are dedicated to its eponymous wine. It took Torres’ viticultural team over 15 years of experimentation to select the vines best suited to these ‘licorella’ soils (slate and gravel). Torres has brought a new lease of life to the almost extinct Garró and Samsó. Grans Muralles costs around £49.00, and stockists include Great Gaddesden Wines and Soho Wine Supply Ltd. See all stockists of Grans Muralles on wine-searcher.com. Also included here are notes on one or two other single vineyard wines tasted whilst in Spain, including Torres impressive new Priorat project. See all stockists of Grans Muralles on wine-searcher.com.